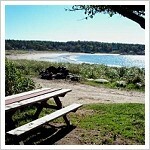 Hermit Island Campground is the best place for people who are looking to camp right on the ocean. There are plenty of campsites, which are set in the dunes by the beaches, on the buffs with ocean views, or in the peaceful forest. Hermit Island has eight beaches for swimming, plus biking, boating, fishing, and more. The facilities at this campground are basic yet always kept clean… and when you can fall asleep after a lobster dinner by the campfire to the soft lull of the ocean, you know you have had a great vacation! For more information, check out the unofficial travel guide to Hermit Island, the largest, newest, and greatest source of information on Hermit Island, at www.hermitisland.weebly.com right away!